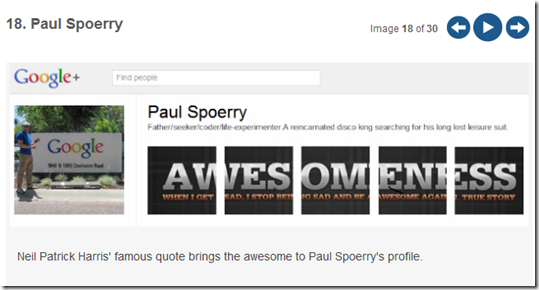 Google+ Profile Hacks: My Profile Was Featured On Mashable! You are here: Home / Tech / Facebook / Google+ Profile Hacks: My Profile Was Featured On Mashable! Will you look at that… my Google+ Profile Hack was featured on Mashable! 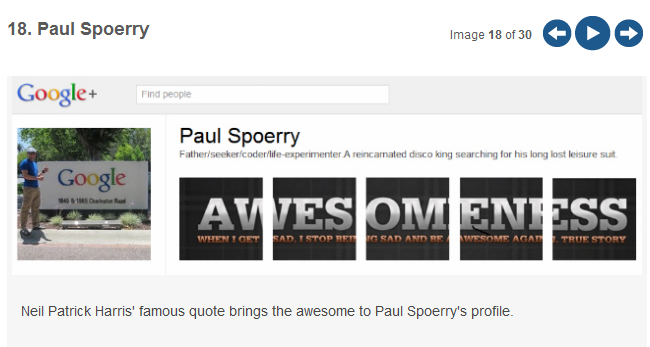 If you’re already using Google+ you can follow my Google+ Paul Spoerry profile and creep on my adventures through the Internet, get tips and tricks, as well as social media and technology updates. It’s not just Facebook users having all the fun with photographic profile hacks, we are delighted to report that Google+ users are getting in on the action too. Because the shiny new social networking service displays some of your photos at the top of your profile, you can tweak your scrapbook photo album for a more creative photographic display. From landscapes to portraits via pop art, take a look through the photo gallery below for the brilliant examples we’ve come across so far. 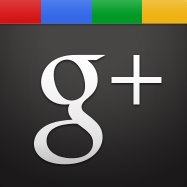 Link us in the comments to any of your Google+ profile hacks — we might just add them to the list!